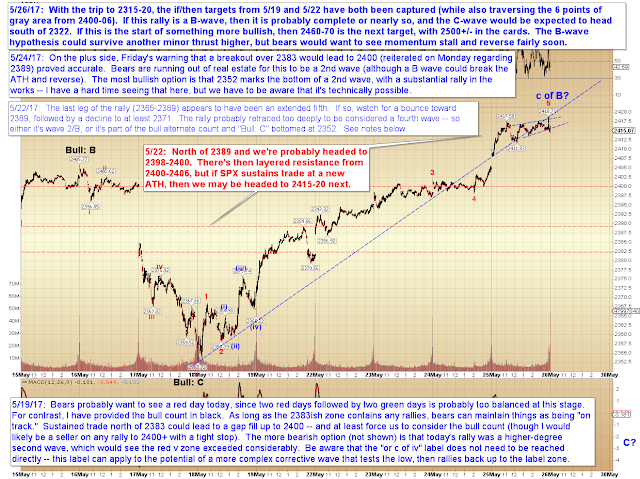 Yesterday, SPX cleared the ATH and ran to the next target zone of 2415-20. 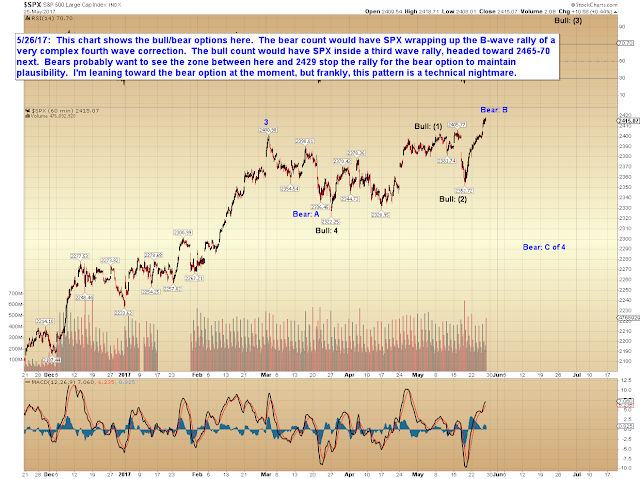 This has at least helped clear out a couple options, but this remains a difficult market to anticipate due to the noise pattern that preceded the current wave. Sometimes you can look at a pattern and make a clear call with Elliott Wave -- such as back in November 2016, when the call to 2400 SPX was clear because the pattern was clean. Sometimes, you can instead discuss probabilities. And other times, all you can really do is discuss possibilities -- but even this has value, because it is often still able to identify potential turning points, which allows one to avoid things such as going stubbornly long right before a possible top and vice-versa. 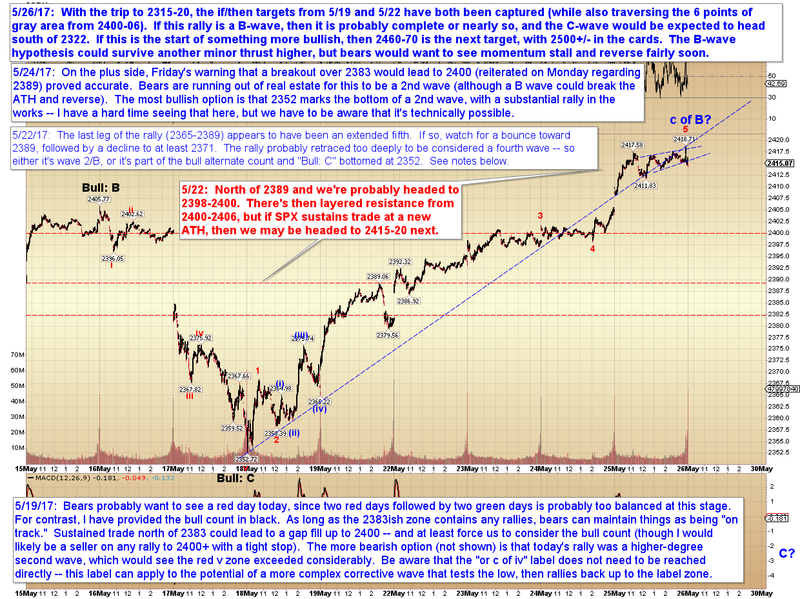 Moving in for a closer look, we find that the if/then equations of the past week have been helpful, since last Friday I suggested that a breakout over 2383 would lead to 2400, then noted that a breakout over 2406 would lead to 2415-20. Since both of those targets were captured, that amounts to having the trend direction correct for 29 of the last 35 SPX points the market has traveled. In conclusion, it's a little difficult to envision a decent-sized bull wave underway here, but "difficult to envision" is hardly grounds for declaring it impossible. It most certainly is possible. Interestingly, RUT and BKX are still well below their respective swing highs, and both of those markets continue to look relatively weak compared to SPX. 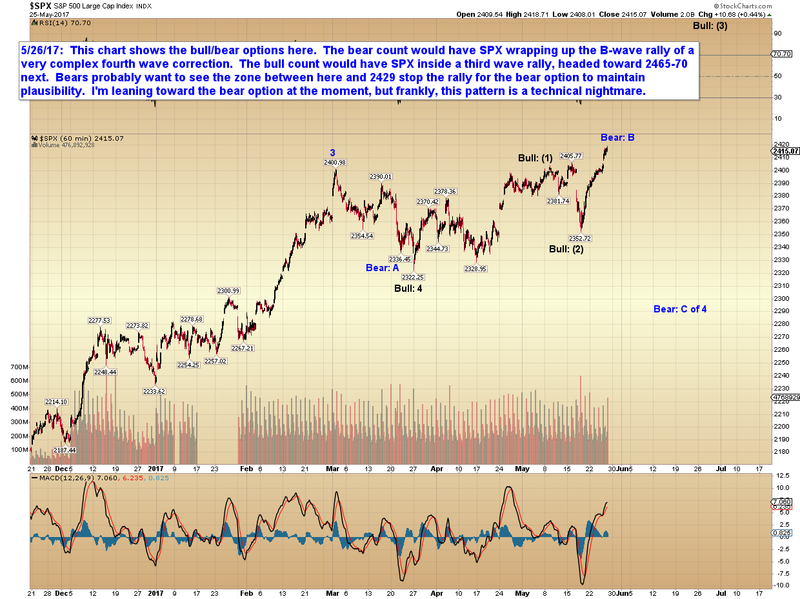 The question at this point is how much SPX can rally before, say, BKX needs to pay the piper and halts SPX's advance. From an analytical standpoint, the problem with it being so far below its swing high is that it leaves a lot of room. I feel I have to default to the B-wave rally here, but there are no clear stop levels until we see our first impulsive move lower (which gives us the high preceding the impulse to act against), although first resistance is the current price zone (which was previously a target), so it's possible the rally will stall here. Trade safe.